My Jewish Learning is all about empowering Jewish discovery. For more than a decade, My Jewish Learning has provided answers to any Jewish question you might have, no matter your background or denomination. 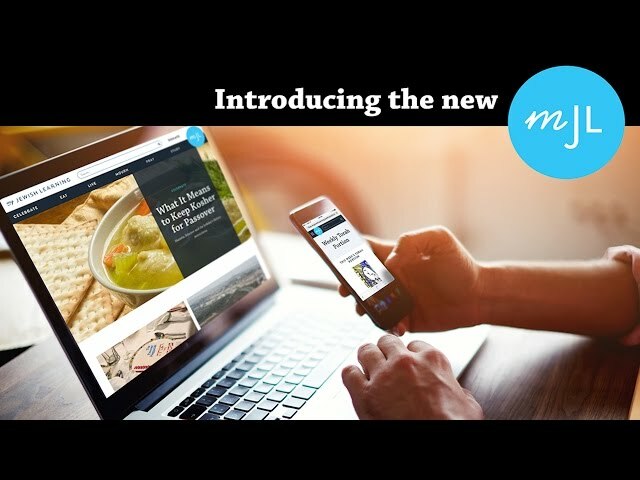 A new design that makes MJL easier to navigate, especially on mobile devices. Dozens of vivid new videos that make Jewish history, practice and culture come to life. More food! We’ve enhanced our recipes and created many how-to videos to help you prepare better for every holiday and Shabbat meal. A new emphasis on making Jewish texts understandable and relevant to contemporary users, with unique weekly Torah commentaries from some of today’s leading voices. Help for non-Hebrew speakers! Don’t worry if you don’t speak Hebrew or don’t know all the Jewish lingo. Throughout the site you’ll see definitions and pronunciation help for hundreds of common Jewish words, from aliyah to zemirot. Beautiful new photography and artwork that make our text come to life. If you’re a My Jewish Learning newsletter subscriber, you’ll notice changes in your daily newsletter, too. We’re bringing you the best of My Jewish Learning five days a week, to help you better prepare for holidays, understand each week’s Torah portion and discover something new each day. We’re also continuing our focus on food a few times a week, so you’ll see regular emails from our popular food blog, The Nosher. We’d love to hear what you think! Get in touch with us at community@myjewishlearning.com to share your feedback. We hope our new look empowers YOU to explore Jewish living and learning from all angles, no matter where you are in your journey.